Booking an appointment is essential at the Keystone Clinic. 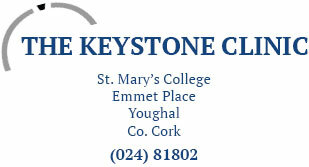 Please call the landline on (024) 81802 or e-mail info@keystoneclinic.ie. Alternatively you may contact Marianne on (087) 3561605, Suzanne on (083) 8455815 or Gosia Lawnicki on (087) 310 1157. Anyone is welcome to contact the Clinic. Generally, clients self refer for counselling. However, clients are also referred through their GP, school, other counsellors, previous clients, community workers, nurse or social worker etc. Your first appointment allows you to experience how we work at the Keystone Clinic and helps you to decide if counselling is right for you. We welcome all your questions and queries about counselling and the services we offer. Together you and your counsellor will begin to explore what brings you to counselling at this time, your hopes and expectations, needs and supports. At the end of the initial assessment you will together agree on the next step. If you wish to begin regular counselling, you and your counsellor will decide on appointment times and frequency of sessions. We may also need to refer you to another service and will help you with this transition. In the case of minors (under eighteen) it is standard practice that your counsellor will meet with the parents or guardian first. The initial session is therefore with the adults. This allows for a history to be gathered prior to commencing with the young person, and for a consent form to be completed. Counselling works best if the appointment is regular and where possible at the same time. Weekly sessions provide the containment for safe effective processing of personal issues. However, in today’s world there are often work- rotas to be considered and some flexibility is important. This can all be discussed at your initial appointment. Generally, a session lasts an hour. The cost of one-to-one individual therapy is €60, with couples and family therapy costing €75 for the session. A sliding fee scale is available and can be discussed with your counsellor. With respect for each individual and the counsellor’s time, we require at least 24 hours notice if you are unable to attend; otherwise, payment will be expected for the missed session.